"The Wakefield Mothers' Club presented an operetta for children, Cinderella in Flowerland, or The Lost Lady's Slipper on Friday evening, October 24th and Saturday, October 25th at the Wakefield High School Auditorium. The operetta by Marion Loder featured Maria Costa as the Fairy, Pauline Erikson as Cinderella (Daisy) and Mary Lord and June Purcell as the Proud Sisters. Among the 63 cast members were Clara Giuliano, Priscilla Bourdon, Bertha Climo, Morris Stoddard, and Eleanor Davison. The operetta had four scenes: Princess Sunshine's invitation to the May Day ball Godmother Nature sends Daisy off to the ball the May Day ball and the shower and Princess of Sunbeam Castle. All tickets for the Friday performance cost 50 cents each, while Saturday's performance had a 25-cent ticket price for children. Bad weather was responsible for only half the seats being filled at both shows. According to Saturday's edition of the Wakefield Item, 'Catchy music, a variety of brilliant costumes and the strong appeal that child actors always make combined to make this first performance most pleasant.' The review also noted that the some [sic] of the 'little chorus flowers were as genuinely interested in the audience as it was in them.' " - Text from calendar by Jayne M. D'Donofrio. 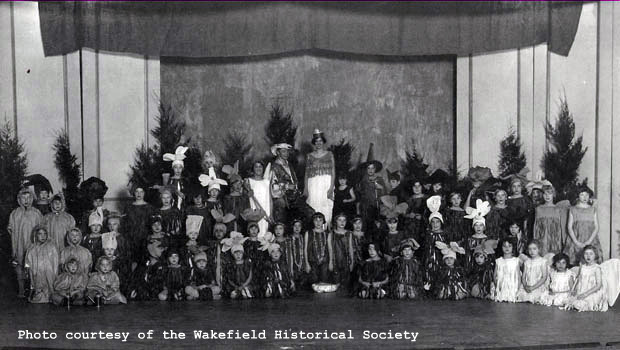 “Wakefield Mothers' Club operetta, October 1930,” NOBLE Digital Heritage, accessed April 22, 2019, https://digitalheritage.noblenet.org/noble/items/show/6849.